The June Hancock Mesothelioma Research Fund (JHMRF), which was one of the prime movers behind the establishment of an annual day of action on mesothelioma, was active at two locations this year. In conjunction with Asbestos Support West Midlands, the JHMRF took part in a memorial service at St. Philips Cathedral, Birmingham presided over by the Dean of the Cathedral in the company of the Lord Mayor of Birmingham; a reception at the Birmingham City Council House and a ceremonial dove release followed the service. 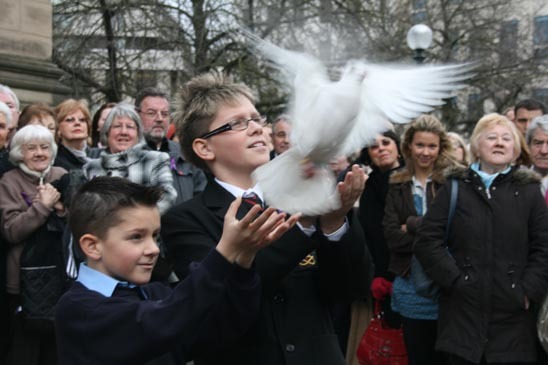 Luke and Ben Wright release doves in memory of their Granddad (Photo: Cath Christian). The presentation by Marianne Tavares, from St. Gemma's Hospice, Leeds, stimulated much interest amongst audience members. Marianne, whose work in the specialist palliative care unit has brought her into contact with many people suffering from mesothelioma, described a range of complimentary therapies which are available at St. Gemma's to help symptom management, promote relaxation and reinforce self-help strategies including: massage, aromatherapy, acupuncture, hypnotherapy, reflexology. Marianne spoke of practical techniques such as the use of steam inhalation and aroma sticks which patients were finding useful. Other speakers included Dr. Tabi and Laurie Kazan-Allen who addressed the subjects: Immunology for the Uninitiated and The International Ban Asbestos Organization. During the morning meeting, a new victim support group  Mesothelioma & Asbestos Related Concerns ( MARC)  was launched.5 The formal program ended with a summing up of the day's discussion by John Battle, Member of Parliament for Leeds West, who urged delegates to press the Government to support plans for a National Center for Asbestos-Related Diseases. The Leeds AMD 2009 event was brought to a close by a ceremonial dove release from Millennium Square. The �1500 raised from raffles and contributions on the day will be donated to mesothelioma research. The JHMRF meeting in Leeds. 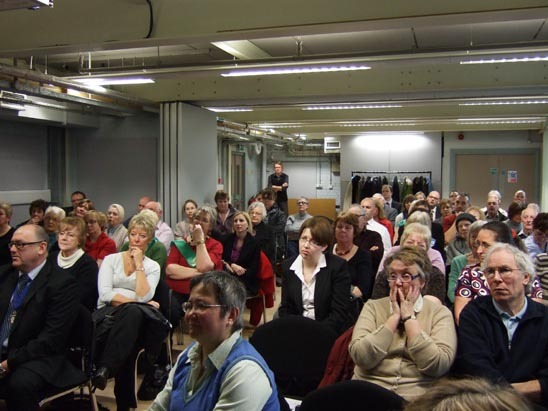 Remembering asbestos victims was high on the agenda of another activity in Glasgow on February 27. The event organized by the Clydebank Asbestos Group featured a showing of the landmark TV documentary broadcast in 1982, Alice  A Fight for Life.7 Guest speakers lead a discussion stimulated by the moving documentary about the life and mesothelioma death of Alice Jefferson. Nearly 27 years after it was made, many of the concerns highlighted in this program remain current. 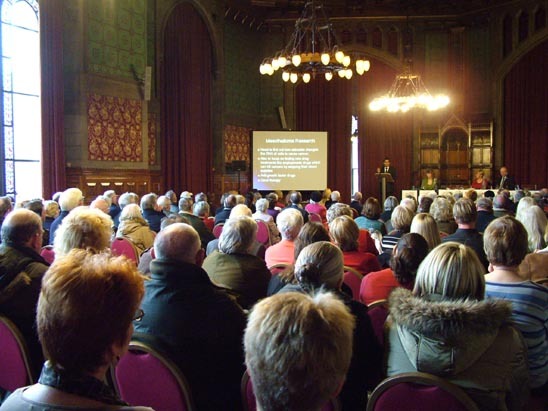 A public meeting at Manchester Town Hall, attended by nearly 200 people, was addressed by MP Tony Lloyd, MP David Crausby, Dr. Jennifer Hoyle, Consultant for the Mesothelioma Cancer Network, and Consultant Respiratory Physician Dr. Dev. Other MPs who were in attendance, Paul Rowan, David Heyes, Graham Stringer and Jim Dodson, added their voices to calls for government-funded mesothelioma research. BBC North West included an interview about the significance of AMD on breakfast time TV which was followed by another piece about the event itself. Both Radio Manchester and the Manchester Evening News covered AMD; a full page newspaper article featuring the ex-Coronation Street actor Bruce Jones, who played the character Les Battersby, and mesothelioma sufferer John Willetts raised awareness of the impact this cancer is having on local people. 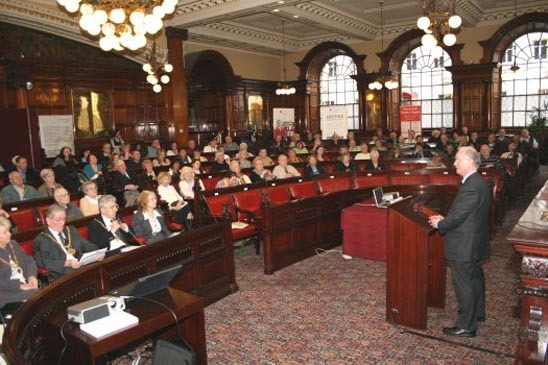 In Liverpool, the Merseyside and Cheshire Asbestos Victims Support Groups held a joint meeting at the Town Hall which was addressed by medical experts and civic dignitaries. The AMD 2009 symbol chosen by the Sheffield and Rotherham Asbestos Group (SARAG) was the snowdrop. On Friday, SARAG started their AMD remembrance dedications by distributing 250 pots of snowdrops outside Barnsley Town Hall. This was followed by a public meeting which called for government funding for the establishment of a national research program. The speakers at the meeting included local politicians, MPs, trade unionists and mesothelioma charity representatives. The day's activities raised �1650 for mesothelioma research. As a consequence of its industrial past, Derbyshire is an asbestos hotspot; due to the local prevalence of this cancer, mesothelioma has been dubbed a scourge in Derbyshire.9 On AMD 2009, events were mounted in Leicester and Derby by the Derbyshire Asbestos Support Team (DAST) which has, in the last five years, provided emotional and practical support to 121 people with mesothelioma. Leicester's 4th AMD event was organised by mesothelioma widow Linda Thornton, in collaboration with her DAST colleagues. A service at Leicester Cathedral was followed by a symbolic dove release in memory of the town's many mesothelioma sufferers, amongst which was Linda's husband Roger. In Derby, the relatives of those lost to mesothelioma attended DAST's February 27th meeting which started at 10 a.m. at the Quad, in Derby's Market Place; speakers included a lung cancer nurse specialist, two trade unionists, a solicitor and mesothelioma widow Val Pepper and widower Mike Lees who, since his wife's death from mesothelioma, has become the country's leading expert on asbestos in schools.10 The program was concluded with a short production by a local theatre company which highlighted the ongoing threat posed by asbestos products hidden within the UK infrastructure such as the contaminated building materials which remain in schools. There is no shortage of mesothelioma victims in the South of England and victim support groups active in London, Hampshire and Plymouth all marked AMD. 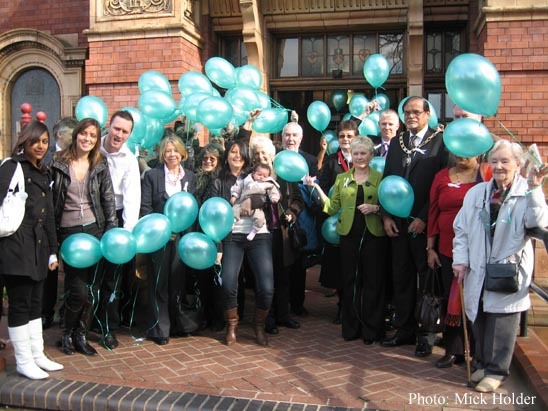 An informal fundraising coffee morning, organized by East London Mesothelioma Support (ELMS), was hosted by Newham's Civic Ambassador Councillor Clive Furness in Newham Town Hall. Mesothelioma widow Eileen Beadle, who founded ELMS, said that the purpose of the event was to increase awareness of the dangers of being exposed to asbestos and, of course, to raise funds that will go to the Lung Cancer & Mesothelioma Research Fund at St. Bartholomew's hospital. In all, a total of �1,800 was raised on the day from contributions, raffles and a sponsored balloon release. 1 Mesothelioma, a deadly form of asbestos cancer, is the signature disease of a group of asbestos-linked illnesses and, as such, is a symbol of the overall damage done by the country's use of millions of tonnes of asbestos. 2 Asbestos Victims Support Groups Forum (UK) Press Release. Call for government funding for mesothelioma research centre. February 2009. 3 Cook E & Swain M. The Dust of Death. March 2, 2009. 4 To protect his privacy and that of his family, the real name of this speaker is not being used. 6 Taylor M. Asbestos-linked cancer victims honoured as plaque unveiled. The Herald. February 28, 2009. 7 Willis J. Alice  A Fight For Life: 25 Years On. British Asbestos Newsletter, issue 67, Summer 2007. 8 Merseyside and Cheshire Asbestos Victims Support Group Press Release. Call for government funding for mesothelioma research centre. February 2009. 11 Doves bring peace message to cancer victims. The News. February 28, 2009. 12 Asbestos campaigners back awareness day. February 27, 2009. The Herald.